After you dine in a restaurant in India, chances are there that the little percentages and amounts added to the total bill will confuse you. Although the Govt. 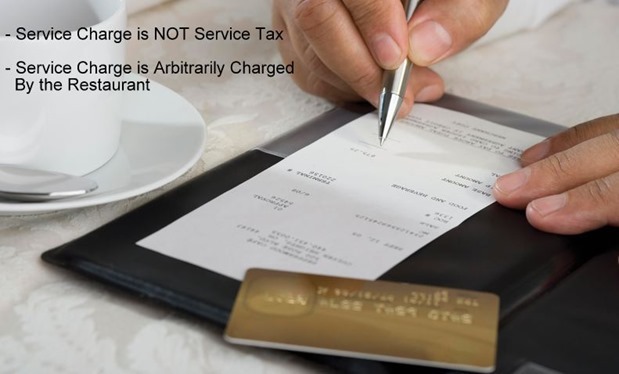 has clarified that service tax of 14% on 40% of the overall bill (effective rate: 5.6%) will only be charged at AC restaurants/hotels, customers have realized that the total payable amount doesn’t tally with the expectations. In most of the cases, the customers just ignore it, or they can’t locate the exact resource to clear their confusion. Sensing the need, Finance Ministry has issued a clarification regarding service tax and service charge; and now, it makes clear that customers are being duped. Here is the big, bold statement which customers in India should memorize by heart: Service Charge is Not Service Tax. In fact, any service charge which we pay we retained by the restaurant, and Govt. doesn’t get any of that money. VAT and Service Tax are the only payable amount which goes to the Government coffers. But What Exactly Is Service Charge? Service charge is nothing but an organized and enforced way to collect tips for waiters and support staff. And there are no guidelines for the same! It can vary from 4% to 20%, depending on the restaurant/hotel’s internal policy and sometimes mood. They assume that giving tips is mandatory, hence, they add service charge to the overall bill which means that the customer is giving tips to the staff. Present Govt. has not indicated whether customers should pay for this service charge or not, but has certainly clarified regarding its intensions. Assume you have ordered foods worth Rs 1000 in an AC restaurant (service tax can only be charged in a AC restaurant/hotel). The service charge, which we have assumed 10% may sometimes go upto 30-40%, depending on the restaurants or hotel. And VAT is always state specific. Hence, after this clarification, it is recommended that customers should always make it clear regarding the service charges to be levied by the hotel or restaurant before ordering any food. And in case it is unavoidable, then there is no requirement to give tips, as the service charge will already cover that expense. Remember, Service Charge is not going to the Government of India, but to the Restaurant owner. "Service Charge Is NOT Service Tax On Restaurant Bills, Finance Ministry Clarifies", 5 out of 5 based on 11 ratings. if any restaurant is found doing so, where should we complain about this ? Why do restaurants levy a Service Charge? Tipping is not mandatory but such a levy makes it mandatory? I believe both the Restaurants and the customers should move towards mobile receipts. We at InReceipts.com are providing free and automatic mobile receipts to the consumer phone. 3) Merchant logo, their brand name, their address and their phone numbers are listed to all the users of InReceipts app and there by we increase your footfall. Govt is inducing restaurant to increase service charges since more the service charges more will be ST and VAT. Is this not collision. Earlier we were paying tips as service charges up to max Rs. 100/- and now we are paying 10% service charges? Why we need to include service charges with Total Food Bill while calculating service tax and VAT, the tax should be calculated only on Total Food bill…right? Does Taxes applicable on Service charges too? I also think in the given example of food bill VAT should be charged on 1000 rs., i.e., only the food bill, and not on 1100 rs., which include 100 rs. Service CHARGE. = 150 rs. (assuming state VAT rate 15%). So, VAT on Food bill only, and not on Service Charge. As far as Service Tax is concerned I think it should also be charged @ 14% on (40% of only the food bill and not on Service Charge), i.e., @ 14% on (40% of 1000 rs.) = 56 rs. Whats opinion of the author on this. Would you like to correct author’s illustration given in the news article. yeah i agree with you.This article make the wrong calculation. it should not be charged on service charge.